Snowflakes Slot is an online video slot game of 5 reels and 30 paylines powered by NextGen Gaming software platform. This video slot can be played using coin sizes of 30p per spin to 600 per spin. There are 3 bonus round features available in this game, where you can receive 7 to up to 30 free spins and 1x of multiplier. This slot offers a jackpot of 500 coins on your total bet. You can play Snowflakes Slot at any of your devices including desktop, mobile phones and at tablets using any of Nextgen online casinos for real money. 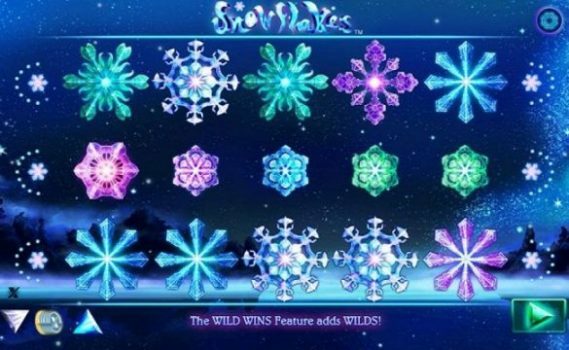 Snowflakes slot is tremendously awesome game which includes 10 different kinds of Snowflakes such as blue, green and purple. The game features beautiful stars in the night skies, which looks perfect. The wild symbol in this slot will offer you a maximum of 500 coins, and it can substitute all other symbols except the scatter one. As mentioned, there are 3 bonus features available in this game. The first bonus round is The Icy Wild. The Icy Wild:-This bonus feature can be triggered randomly during base game. In this feature 5 symbols (1 per reel) will transform to the wild symbols. The second bonus feature is The Wild Wind feature which also gets activated during the base game with up to 5 wilds added to the reels. Another feature is the Frozen Wilds Free Games feature which can be triggered if a player landing on 3 or more of the scatter symbols on active paylines. 3 scatter symbols will offer you 7 free spins and 5 times of your stake, while 4 scatters will offer you 10 free spins and 20 times of your stake and 5 scatters in a row will offer you 15 free spins and a whooping 100 times of your total stake. Personally I have played Snowflakes Slot many times and I can say that this video slot is a perfect game from the house of Nextgen gaming.